Hunting for the bugs and other goblins that freeze up video games and plague other computer software could be the future of Westbrook. The city is seeking a grant to study the creation of what could be Maine's first testing laboratory to help businesses identify and fix software problems. Westbrook would partner with local colleges as well as MESDA, Maine's software and information technology industry association, to create a program that would train young people to be part of a growing industry. The goal is to give students real-world experience working on software of outside companies as they move from high school to technology degree programs in community colleges or a university. Global competition has taken jobs in game testing and quality assurance overseas to places such as India and China, where it can be done more cheaply, said Joe Kumiszcza, executive director of MESDA. But in recent years, technology has changed the testing processes, making it potentially cheaper to do here, he said. In the last several years, video games have become a huge industry, with companies making profits that rival those of Hollywood studios, Kumiszcza said. He said a software testing laboratory of this kind would be a first for Maine. The laboratory could prepare a new work force and help drive economic development in the state, Kumiszcza said. Top ten sites found when entering "Software testing consultancy" into the MSN.com search engine. Software testing and quality assurance consulting services. Features resources, forums, tools, and downloads. CONSULTING SERVICES. Telesis provides consultants who are both highly skilled in software testing and understand critical business processes and software products. Most people know that the First Emperor of China was buried with a massive terracotta army. What they don’t know is that there were other terracotta figures buried which are not soldiers. This picture (see below) clearly depicts a group of software test consultants about to get to grips with some tricky test conditions. Is this the oldest known artefact depicting more than one software tester? That question was sent in by Tracey Temple. 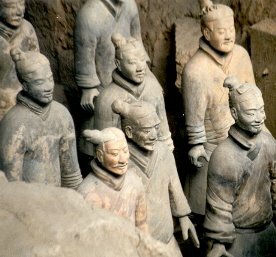 Tracey, the picture you sent is obviously a group of terracotta figures from the Mausoleum of the First Emperor of China, Qin Shi Huang. What is not so obvious is why you think they are software testers. I know that the 8th International Symposium on Future Software Technology 2004 was held in Xi'an which is where the terracotta figures were buried over 2000 years ago. The topics covered at this event included testing methodologies, quality improvement and testing, and object oriented testing techniques. The close proximity of software testing specialists and terracotta statues at this event may have caused your confusion. Another way to become confused is to ingest mercury, which attacks your brain and leads eventually to death. In a strange echo of the past, Qin Shi Huang also took mercury and ended up going mad. The mercury in question is the metal not the testing tool company. Since there was no software in 210 B.C. there would not have been any software testers. So the answer is no. How many aliens attended a user acceptance testing training course in the UK in 2005? That question was sent in by James Morrison Weatherby George Dupree, who, incidentally, claims that his mother was abducted by aliens while going down to the end of the town. As with all software testing activities I need to make sure that I understand the requirement here. By aliens do you mean people who are not subjects of the UK? Or do you mean beings from another planet? If it is the type of alien that set Buck Rogers' pulse a racing, then I would estimate a lower number; probably zero. To be more precise than this, I would need to know the attributes that differentiate aliens from non-aliens. Some claim that there are alien life forms that look, sound and smell like attendees of acceptance testing courses. Some suggest the converse is true, demonstrating the need for precise tests and keen observation. If only Dr Smith were not still lost in space I am sure we would have this suite of tests freely available today.